Hello, I firstly want to apologise as I think this post is going to a be a bit of a ramble as I try and get my thoughts written down. Today's Blogmas was originally going to be my Christmas wish list but given the events in my family this weekend it just didn't seem appropriate to write a post that, in light of things, seems quite selfish. At this time of year it is very easy to get caught up in Christmas, and rightly so, we smile more, we sing more and in general we have so much to look forward to in the run up to Christmas Day. But sometimes things happen that bring that our world crashing down and remind you about mortality and the importance of family. My Gran has been ill for a few years now, the kind of illness that has completely taken away who she was and has caused her a huge amount of distress. It meant that the phone call I received yesterday wasn't wholly unexpected but came as a surprise all the same. My Gran had taken a turn for the worse and the time was coming to say goodbye. Unfortunately it's not the first time I've had a call like that. A few years ago when I was at university I had the same one and rushed back home to visit her in hospital. Amazingly the doctors pulled her through, she's a fighter (my Mum would say stubborn!) just like my great gran before her. I don't want to dwell on that though, although I feel the need to say something (more to give me a way of expressing it than anything else,) as this blog is not the right place to do so. What I want to do is to remind you at this time of year to always hug your family close, to spend more time with the elderly who feel the affects of winter more than most, to donate to the relevant charities if you can. I don't want to bring anybody down because Christmas is the time of year when our hearts should be light and we should be cheerful. It's just with all the Christmas adverts, Blogmas and YouTube videos it's easy to get swept away in it all. 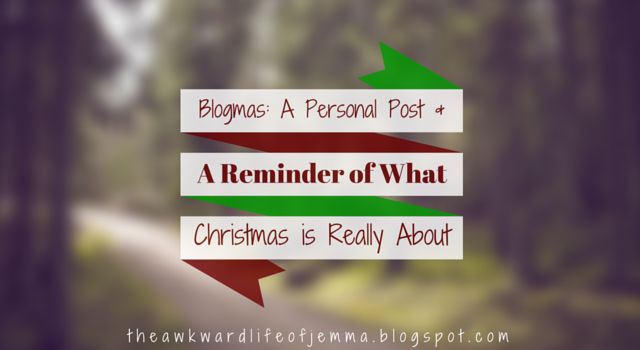 I'm hoping to still do Blogmas but the tone of my posts may change a little and my schedule might be a bit off. I've been really excited to write some of wish lists, gift guides, DIY and baking posts that I've planned but only time will tell if I'll be up to writing them. I don't know how this week will unfold, I'm still waiting on more news, so it is impossible to plan anything. If you don't hear from me for awhile you'll know why so I'd like to wish you all a very Merry Christmas now just in case my blog does go quiet for awhile.